Sant Rajinder Singh Ji Maharaj, World Renowned Spiritual Master of Meditation on Inner Light and Sound, is internationally recognized for his work toward promoting inner and outer peace through spirituality. Among his many awards and tributes are 5 honorary doctorates in recognition of his tireless efforts. His books and articles are available in fifty different languages. Some his latest works include “Spiritual Pearls for Enlightened Living”, “Silken Thread of the Divine”, “Inner and Outer Peace through Meditation” and “Empowering your soul through Meditation”. 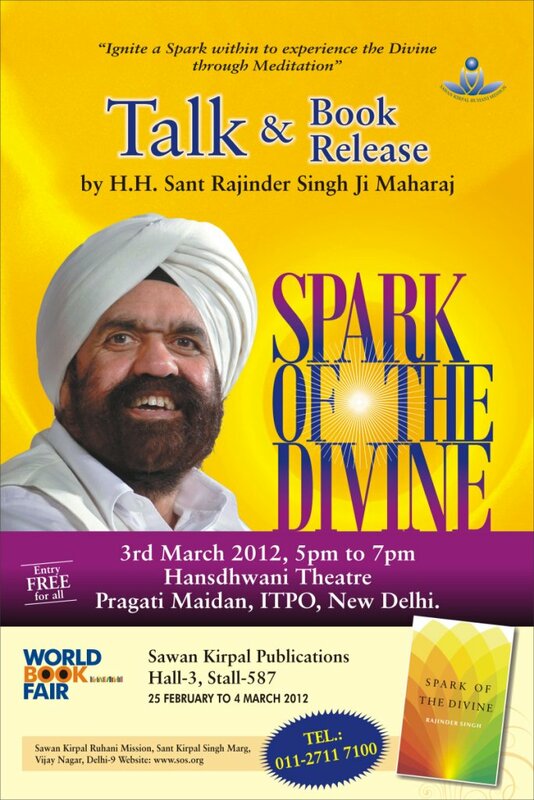 Grand Book Release of ‘Spark of the Divine’ will be preceded by a Talk by the Esteemed Master focusing on discovering the divine spark and exploring our own potential to attain peace, bliss and happiness in our lives. Venue: World Book Fair, Hansdhwani Theatre, Pragati Maidan, New Delhi.